The complete line of Crew restroom cleaners tackles tough jobs and leaves guests wondering if you ever rest. 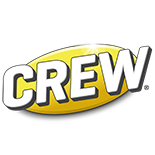 All members of this crew are easy to use and quickly power away soils, soap scum and hard water stains. Versatile, one-step Crew cleaners leave every restroom surface sparkling. Scientifically formulated surfactant block eliminates odors. Continuous release controls malodor and helps prevent mineral build up. Lasts approximately 3,000 flushes per screen. Each 1.4L SmartDose™ creates up to 25 - 32 oz. spray bottles. Removes tough soap scum and restroom grime.